JENNIE MARTS’ Character, Cherry Hill!! Hearts of Montana Book 2, by JENNIE MARTS. Cherry Hill Do you have a nickname? No. Born and raised in Broken Falls, Montana. I was practically raised by my grandparents and my best friend has always been my cousin, Stacy. That’s why I am so devastated that Stacy and her husband were just killed in a terrible automobile accident. Stacy named me as the guardian for her son, Sam. My grandparents left their family diner to me when they died and the rest of the Hill family look down on me because I stayed in the small town of Broken Falls and took over the diner instead of going to college like they did. My cousin Reed is a lawyer and a bully, and the only reason he’s mad that I got the diner is because I got something special that he didn’t. They don’t think I’m good enough to take care of Sam and are trying to take him away from me. The only thing that matters to me is Sam. And I won’t let them take him away from me. I’ll do whatever it takes to keep him—even pretend to be engaged to my old flame, Sheriff Taylor Johnson, in order to prove I have a stable way to provide for him. 5. Do you have a secret? If so, who do you need to keep the secret from and why? Actually, I have a HUGE secret. Sam is really my son! Stacy and her husband adopted him after I found out I was pregnant and alone at seventeen. And Taylor is actually his father, but he doesn’t know it. 6. What makes you laugh out loud? What makes you cry? I laugh at almost everything. But dealing with the loss of my cousin and the broken heart of her son, Sam, has had me in tears quite a bit lately. 7. It’s Sunday morning. What are you doing? Give details. Pouring coffee and serving breakfast to the locals at Cherry’s Diner. 8. Has anyone broke your heart? Who was s/he? I’ve only ever given my heart to one man, Taylor Johnson, and he broke it when he left Broken Falls and me nine years ago. 9. What’s the one thing you want out of life that you don’t think you can have? Why can’t you have it? All I want right now is to be able to provide a home for Sam. I would love for Taylor to be a part of that life, but I’m afraid when he finds out the secrets that I’ve kept from him, I’ll lose both him and Sam. 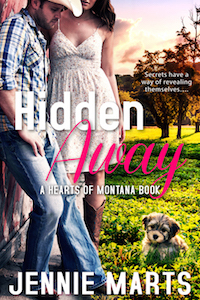 Be sure to come back to read more about Jennie, Cherry, and HIDDEN AWAY, a Hearts of Montana book, on Wednesday’s Karen’s Killer Book Bench. Happy Reading! I think the perfect dessert at Cherry’s Diner would be cherry pie. I hope I win. I love what you’ve told us about your book. Love the interview, in the voice of the character…dessert? No idea…. Me, too, Jennie. LOVE dessert! Cherry cobble…I can’t resist a cobble but if they had a cherry cheese cake that would be my first pick.